My Jack's name is Whiskey. He is a real trouble maker, he likes his friends but can fight anytime. He has a never lasting energy. He caherges every morning as much as he can. But he is lovely, clever, and so sympathetic. He has a good heart and can understand all your moods. He is so popular all around my customers. He plays with horses, longe them and finds something to chase ever. He is 3.5 years old and I am lucky to share life with him. 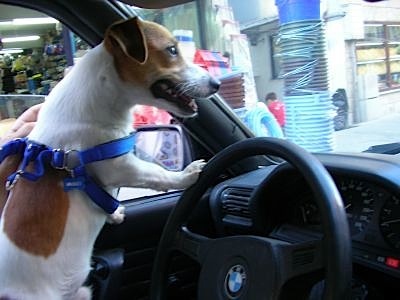 Wow...Any dog that drives a Bimmer is my kind of dog! What model is that? I drive an 05 545i.